The decision about whether to build one of the biggest nuclear reactors at Hinkley Point will no doubt be taken by economists in the Treasury, despite the eye watering costs. The construction cost per megawatt of generating power at Hinkley Point is more than 3 times the cost of other nuclear reactors currently being built in South Korea, for example. There is the separate matter of security and whether giving Chinese organisation intimately linked with the development of Chinese military nuclear weapons a bridgehead on UK soil is wise. However what concerns us here are the two fundamental questions: does it work and is it safe? The Hinkley Point C design, known as the EPR, is new. Four of these are already under construction, one in Finland, one in France and two in China. Hinkley Point C would use two of these reactors. The French and Finish reactors are running very late and way over budget. The Finish one is about 9 years late. It is not known when the French reactor will come online, but it is also many years late. They are all proving to be very difficult to build, with pressure vessels cracking and other serious structural issues. The fundamental problem is that the current design simply does not work. In June 2016, EDF managers told MPs that the Hinkley Point C proposal should be postponed until it has “solved a litany of problems” not least of which is the soaring debt of EDF. The chief executive of EDF, Jean-Bernard Levy stated in September 2015 that the EPR is currently being redesigned to make the reactor easier and cheaper to build. The fundamental problem is that the EPR does not at present work, and there is no EPR working anywhere in the world yet. 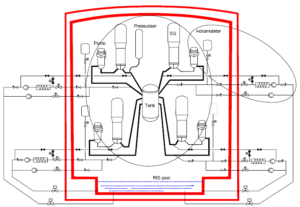 A safety assessment of a reactor upwind of the population centres in the UK is critical. Nuclear reactors have two main control systems, one which manages the operation of the reactor and a separate one that manages safety aspects should a fault occur with the reactor. Independence between these systems is of the highest importance. The present design does not provide anything like adequate safety as these control systems are intimately linked. The reactor needs cooling pumps to be operational for up to 3 years after a shutdown in order to let it cool safely. Should a catastrophic accident befall the reactor (think a fully fuel-laden airliner, 15 minutes into a flight from Heathrow to the US, being flown into the reactor as was done to the World Trade Centre), it is highly likely that the safety system would also be damaged badly. It is very difficult to be confident in a design only partially complete. Without a complete design we cannot know what might happen and what the consequences of such an action might be but they are likely to be serious. The case for building more nuclear reactors in the UK is very strong. Renewables are long way from being able to provide power on dull, still days. Battery technologies are improving but they had to the costs substantially as they have to be renewed at regular intervals. Until these issues are resolved we must accept the capacity of nuclear power to provide the guaranteed supplies everyone in the UK must have. However at present we must recognise that the present plans for Hinkley Point C are flawed and potentially dangerous. It should not proceed until these are resolved. I’m concerned that EDF are going ahead with plans to buld Sizewell C reactors and they still haven’t solved the problems of the reactor, at Hinkley or elsewhere. Will EDF be given ermission to start Sizewell if the reactor is still proved to be unsafe? I think you’re absolutely right to be concerned. The government have so little residual energy these days to consider anything other than Brexit that minor details such as an incomplete design for Sizewell could so easily be ignored. I’m not at all sure what role the nuclear safety inspections bodies might have in this unfortunately.